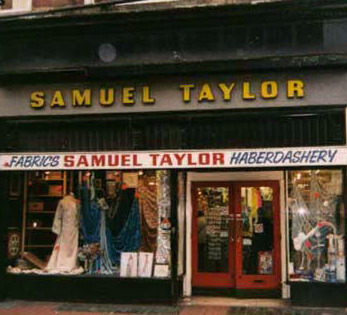 Established in 1947 and now in the 3rd generation Samuel Taylor began by distributing woollen textiles. Having embraced all the major craft trends over the years we have become the main specialist retailer of creative crafts in Yorkshire. With our large team of knowledgeable and helpful staff, we operate from 3 retail sites. We are a specialist retailer, supplying card and paper crafts, scrapbooking, knitting, needlecraft, fashion fabrics, dress patterns and haberdashery. With our vast range of merchandise, we are known for excellent value. We are spreading the word that crafting is fun, enjoyable and tremendously satisfying. Imagine the pleasure of giving a card or gift you have lovingly made by hand. Whether you are new to crafting or an established crafter let Samuel Taylors inspire you to get the best out of your hobby. Our aim is to give all our customers great service with speedy delivery from the largest selection of the best and newest creative craft products available. Copyright © 2019 Samuel Taylors. All Rights Reserved.